We use the following manufacturers for our V.C.I. 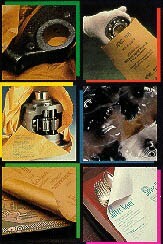 Papers & Films line of products. Daubert VCI, Inc.pioneered corrosion inhibitor packaging almost fifty years ago, providing industry with an effective alternative to conventional corrosion preventatives such as cosmoline, grease, oil preservatives, dessicants and waxed or barrier papers. Today, Daubert's Volatile Corrosion Inhibitor (VCI) packaging protects metals in virtually every industry.